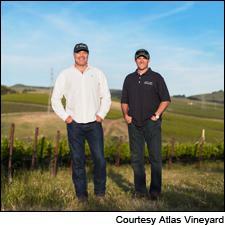 Atlas Vineyard Management's Mike Cybulski (left) and Barry Belli. Price Family Vineyards, owned by Bill Price, the proprietor of Classic Wines and current chairman of Kosta Browne, is teaming up with Atlas Vineyard Management to purchase the Walala Vineyard in the Sonoma Coast wine region from the California Conservation Fund. The 97-acre property includes 17 acres of Pinot Noir and a residence. Neither side would disclose the purchase price, but sources estimate it to be in the vicinity of $2 million. The two firms will manage the vineyard as a joint venture, and are also looking at other potential vineyard purchases. The Walala vineyard is perched at 1,200 feet atop a ridgeline along the northwestern reaches of the Sonoma Coast. The existing vineyard is surrounded by 19,000 of acres of redwood forest. The vineyard was developed and planted in 2005, while it was owned by the California Public Employees Retirement System (CalPERS). It's relatively unknown because of its remote locale, but Pinot fans know it as part of the three-vineyard blend that went into Kosta Browne’s 2009 Sonoma Coast Pinot Noir, Wine Spectator's 2011 Wine of the Year. Napa-based Atlas farms over 2,000 vineyards for some of California's and Oregon’s top wineries, including Bonaccorsi, Kosta Browne and Patz & Hall. Bill Price is the proprietor of Classic Wines and Price Family Vineyards. He also owns and manages Durell and Gap’s Crown Vineyard on the Sonoma Coast, with additional Sonoma County vineyards currently in development. Classic Wines holds ownership interests in Kistler Vineyards, Buccella, Three Sticks and Lutum. Price is also currently chairman of Kosta Browne and Gary Farrell wineries. CalPERS sold the 19,000 acres, including Walala, in 2013 to the California Conservation Fund, which owns thousands of acres of forestland. But the group didn't want to own a vineyard, just the surrounding forest. Vineyard development has been a sensitive topic in the area, as some forested areas have been cleared to make way for vines. The Conservation Fund carved out a 97-acre parcel from the 19,000 acres that included the vineyard. As part of the deal, the purchasers agree to leave the remaining 80 acres of trees standing. As chairman of Kosta Browne, Price had some extra incentive to own the vineyard. “I really liked the geographic diversity of location, it shows a different version of Sonoma Coast, as compared to Gap’s Crown,” said Price. Both Price and Belli are excited about expanding their joint venture, hoping to build a great vineyard portfolio that winemakers will want grapes from. “One of the best ways to grow a brand is bringing in quality fruit,” said Price.